Similarly to Mr Hertzian Cone's interest in making bows I have one in making arrows as I have dozens of arrowheads lying around. So any advice on making them would be good. The arrowhead and hafting I'm ok with, but the fletching, knocking, arrow length and thickness and straightening. Do you know the way of strengthening the knock of an arrow? Normally one cuts the knock across the grain to help avoid splitting but with this method one cuts a knock type groove a little deeper than the knock groove will be with the grain, carefully. Then insert and glue in a slip of hardwood to fit to fill the groove. Now cut the proper knock across the grain as usual and it will cut also into the hardwood slip but will be much stronger in use. Aha! both excellent posts, Mr. G: I have yet to tackle the arrow itself but that clip was excellent, long blades for a draw knife worked for me too. Arrows next for me, awesome timing as always! Chert: sounds like logic to me, go with the grain, if the grain isn't with you it can be changed to your favour! Do you know how to deal with little knots with dead wood in the middle? I have one in the handle area. grr. Chert wrote: Do you know the way of strengthening the knock of an arrow? Normally one cuts the knock across the grain to help avoid splitting but with this method one cuts a knock type groove a little deeper than the knock groove will be with the grain, carefully. Then insert and glue in a slip of hardwood to fit to fill the groove. Now cut the proper knock across the grain as usual and it will cut also into the hardwood slip but will be much stronger in use. Thanks, what sort of thickness and length for the shaft do you find best? did i arrive at the wrong site by accident? Given early Neolithic survials from peat bogs, the diameter is from 8mm to 13mm around the thicker head if the shaft, fnarrr..
Woods vary, from Viburnum to Hazel to Wild Rose stems. Willow would be a good contender too. That's thin, not like a Longbow arrow then, I guess the French weren't so troublesome back in those days.
" 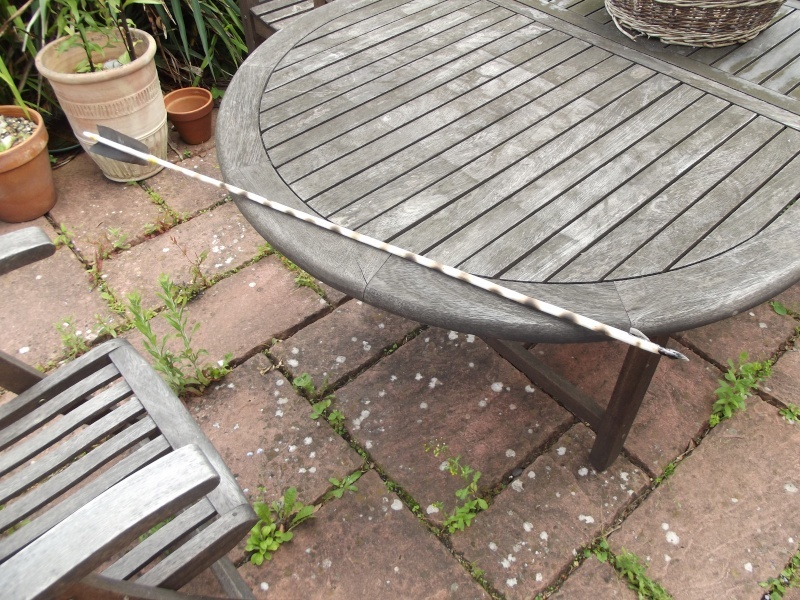 />Right then, here is my first arrow. 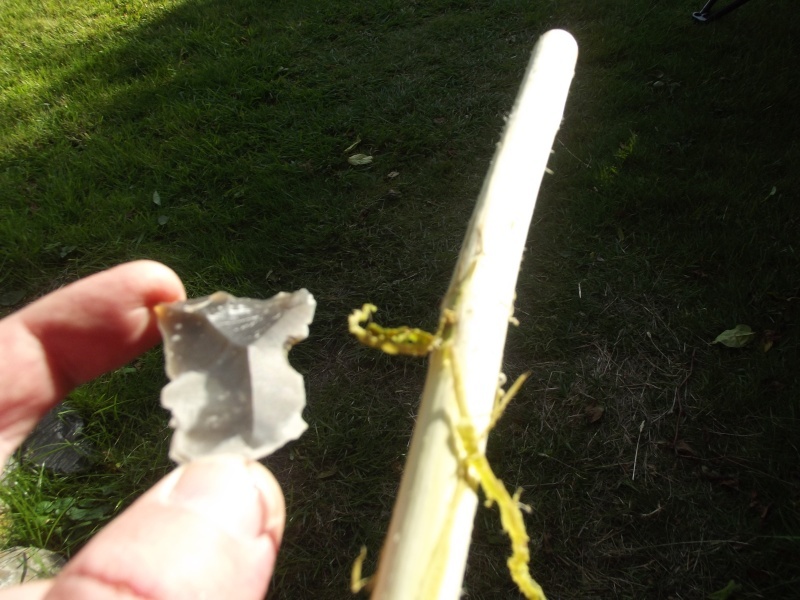 A Mesolithic type with microliths and set in pitch pine glue (which stuck to my finger giving me a nice big blister) with a two feather fleching from rook feathers. 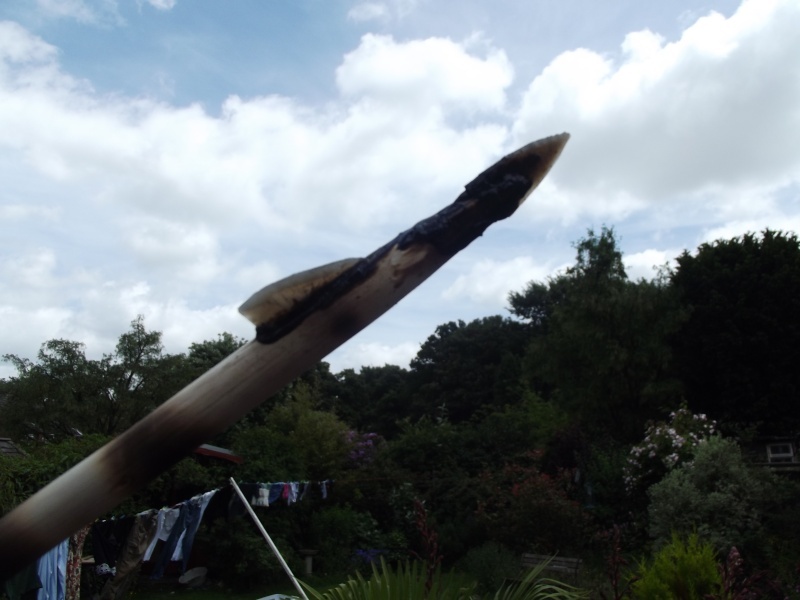 I went a bit crazy with the burn rings on the shaft, but hey ho. Looking at the pics you can also see our laundry (nice) and I've lost the very tip of the microlith too. Puah! Very nice, the American Indians used to paint the shafts of their arrowheads and if an arrow missed too often they'de change the colour. Excellent stuff, I bet you cant wait to shoot it! 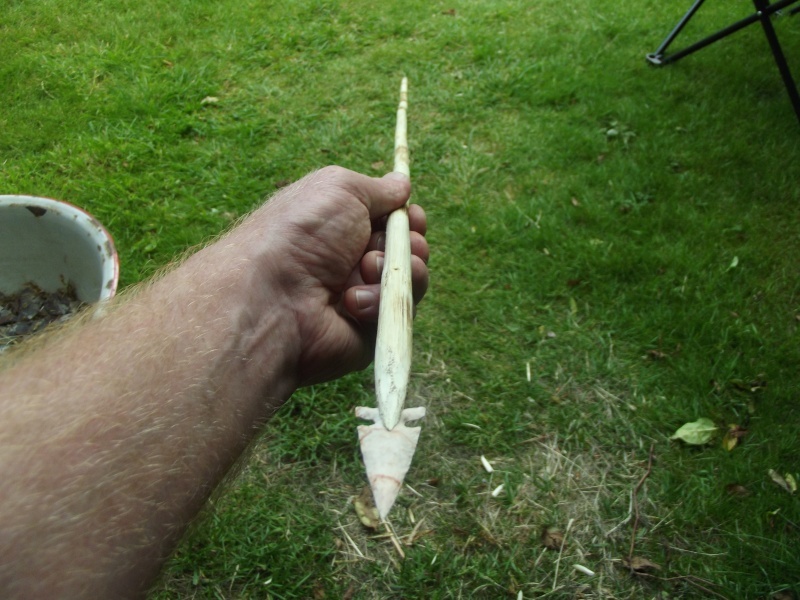 was at a friends yesterday who had made a yew bow - might have to make one up to try.
" /> I whent out with the pruning sheers and found some good stands of Hazel and with a quick snip ether end got some really good blanks for arrow shafts. Not wanting to use a steel knife for stripping the bark, I found a waste flake and nibbled a quick notch from the bulbar side and this works so well for removing the bark cleanly, and very authentic!
" />Green seems to work for me, it soon dries out without the bark. I used the blowtorch set really low to staighten out the kinks and cut a notch for the arrowhead at the wider end and a nock the other. Here with a quick test fitting of a desert side notch point made of the (rather bent) flake of keokuk chert Grendel sent to me. Pleasing stuff to knap with pink banding. Looking good - i would expect that freshly cut shafts would be tied together into a bundle to season a little while straightening each other - i've sometimes done this with hazel sticks for shanks and it does work although final straightening is still needed. Another method is to hang them upside down and let gravity do it, though with lighter sticks you'd need to add weights to the end, hardly worth it with arrow sized sticks where fire will quickly do the job. I'm not sure if green hazel would be too bendy to shoot?